Youth ‘Retreat’ – going ahead? 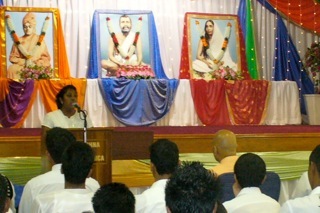 The programme began at 9:00am sharp, when the youth had assembled in the main shrine hall of the Ramakrishna Temple. After the soulful rendition of bhajans and kirtans like Parama dayaal, Swamijiki jeevan gaathaa and moorta maheshwara by the ashram’s Ramakrishna Choir, the youth were treated to another feast. Revered Pravrajika Divyanandaprana Mataji, a respected sannyasini (nun) of Sri Sarada Math, Dakshineshwar, near Kolkata, India, delivered a Talk. She has come to South Africa on a visit and has been staying at Sri Sarada Devi Ashram at Asherville. Notwithstanding the topic entitled – Swami Vivekananda’s Message to the Youth – undoubtedly appealing, the manner in which the learned Mataji eloquently explained Swamiji’s simple 5 step formula to success, was truly awe-inspiring. The formula as enumerated by her was to combine the Five ideas : Goal orientation, Faith in oneself, Service to others, Clean and disciplined habits and Concentration. The first session concluded with meditation and prayers. After a short tea break, the youth reassembled in the Swami Nischalananda Hall, where they waited to a very informative Seminar. 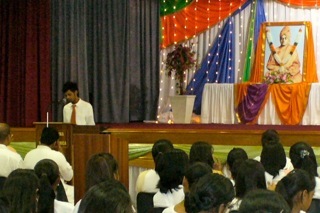 Brother Nikhil Ramdass, who matriculated last year, spoke on ‘Will power and a Disciplined Mind’ with a firm conviction. His recommendations were : identifying priorities, increasing inner vigilance, adopting time saving methods and avoiding meaningless talks. Sister Jessica Thakurpersadh, spoke next on ‘Sri Alasinga Perumal’, one who was referred by Swami Vivekananda as ‘My dearest disciple’. She explained in detail how Alasinga was the initial instrument for promoting Swamiji’s attending Parliament of Religions in Chicago. 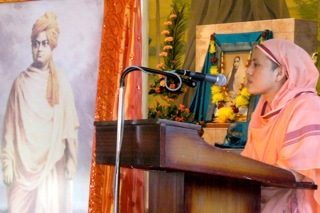 Fired with zeal and fortified with faith in himself and God, how Alasinga started and ran successfully an English journal that preached Vedanta as propounded by Swamiji, was the rest of her illuminating speech. The final speaker was brother Yashmille Raghunundan, who spoke on ‘Swami Vivekananda’s Secret of Work’. He narrated the ‘secret’ at three levels – physical, intellectual and spiritual. He also explained how this concept was closely linked to the eternal teaching of Bhagavad Gita. Yashmille’s powerful exposition was spiced with an interesting Presentation of a slide show. If I say that the youth really learnt a lot, would definitely be an under-statement. The program then passed on to a cultural item. Dance is one of the most ancient of Hindu art forms, and among the most beautiful. After the Seminar, the girls of the Sri Sarada Devi Ashram performed a captivating Kathak Dance. It was truly inspiring and once again reminded us all the lasting beauty of our long standing culture. Thereafter, Dr H.B Parbhoo, a senior devotee and presently the General Secretary of the Centre, gave a short discourse on, ‘Lessons the Youth can learn from the 1860 settlers’. It was truly eye-opening and simply remarkable to learn about the plight of our fore-fathers when they landed here as an ‘indentured labour’, and their great struggle to survive in this foreign land of Natal, under the unsympathetic, iron-fist rule of the British. Even though they were treated like scum, they rose above the challenges and hardships, and slowly but surely, they managed to set up an infrastructure, headed by faith in God, where the Indian community would start to flourish. This Talk indeed brought out in full measure the importance of the unfailing traits that the early settlers possessed. 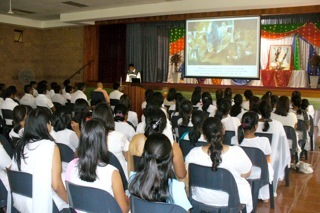 Following this deeply touching Talk, the youth were treated to a DVD presentation. It was part one of a four-part ‘Message to the Youth’, delivered by Sri Swami Bodhamayanandaji Maharaj, a youth monk of the Ramakrishna Order, now in Chennai Centre. Maharaj’s words were like gold, and the youth were simply hanging on to his every syllable. 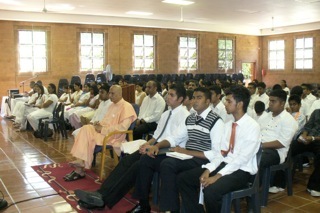 Maharaj addressed various issues and problems affecting the youth in modern times. Methods and techniques for overcoming these problems were alluded to. 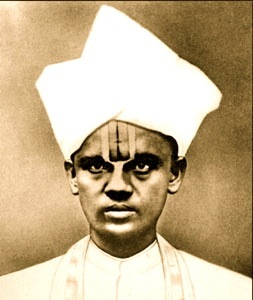 He used copious teachings of the Holy Trinity, especially that of Swami Vivekananda, as he guided the youth with his powerful voice and charged words. After the DVD, it was time for the much awaited Question and Answer session. A panel of three, consisting of Revered Sri Swami Vimokshanandaji Maharaj, Dr. HB Parbhoo, and Mrs Rakhi Beekrum, were in the hot seat. Between them, they astutely handled all the questions posed by the youth. One of the best National Youth Day celeberations report I have read!!!! I was amazed at the wide range of topics covered. Best was link of Alasinga Perumal’s Life. KAPI SE URIN HUM NAHI…… exactly the same words!!!! By Prof. A.V. Narasimha Murthy, former Head, Department of Ancient History & Archaeology, University of Mysore. The year was 1897 and the place was Ramakrishna Ashrama at Calcutta and the occasion was the anniversary celebration of Sri Ramakrishna Paramahamsa. Swami Vivekananda was closely moving with a South Indian clad in dhoti and uttariya, sporting the red and white nama mark on his forehead and taking a pinch of snuff now and then. Many people in the gathering were wondering who this untidy man so close to the Swami was. An American woman who was observing all this could not hide her displeasure and gesticulated her aversion. Unfortunately, Swami Vivekananda observed this and in a raised voice he said ‘Who do you think he is? He is my dearest disciple. He is the faithful man who sent me to America and revealed me to the world’. Everyone was taken aback and looked at that man and that was Alasinga Perumal. May the disciples of Swamiji also inspire us like their Guru! the year we will not be able to quantify his greatness. Maharaj, I feel, you best described Swamiji at the birth anniversary celebrations at HQ when you referred to him as fire. One small glance from Swamiji is enough to reduce negativity, weakness, lazyness to ashes. to serve him and be in his presence were truly blessed. If youth read Swamiji and abide by his teachings we will all witness the birth of the golden age. May Swamiji continue to guide and inspire us! How aptly it applies to our Swamiji! I was so impressed with the youth participants in their Youth Retreat, I thought it better not to write my views and instead why not I use the talent of the youth themselves? Thats how Chetan, who was MC at the meeting, did the report. Bharat from Mumbai says that this was one of the best reports! Just as sun destroys the darkness and Vishnu kills wicked people, your very personality, which is so pleasing to our eyes, removes the three-fold afflictions of all. May we study Swamiji again and again!